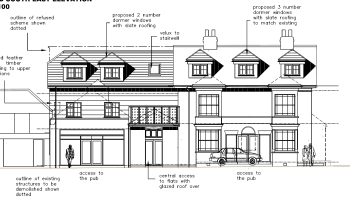 Havant Borough Council: Darryl Howells has secured planning permission for the redevelopment and alterations of a pub in Waterlooville to provide a total of eight apartments. The approved scheme was designed by local architect B H Architect Limited following an interesting planning history. A first scheme that sought the demolition of the pub building and the erection of a block of 10 flats was refused, and subsequently dismissed at appeal on design grounds. During the consideration of that planning application, Darryl advised the client to submit a Prior Approval application under Part 11 of the General Permitted Development Order 2015 that allowed for the demolition of the building as it was not listed nor located in a conservation area. That Prior Approval application was approved but needed to be completed within 12 months from the date of the application’s submission. Shortly after the Prior Approval decision being issued for the demolition of the building, the Council’s Conservation Officer issued a Building Preservation Notice (BPN), under Section 3 of the Planning (Listed Buildings and Conservation Areas) Act 1990. The BPN effectively listed the building giving it statutory protection for 6 months, until such time that the Secretary of State confirms the Order or not. Darryl successfully convinced the Planning Inspector that the condition of the building was not worthy of protection and the BPN was quashed. Darryl then approached the Planning officer and the Conservation officer to discuss a revised scheme. The applicant was agreeable to keeping the building (subject to modification and conversion of the upper floors to flats) and the erection of a 3 storey extension to provide 4 additional flats. The officers welcomed the approach of the revised scheme as the exterior of the existing building would be generally preserved. 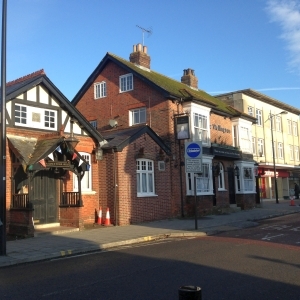 On Darryl’s advice, the revised planning application was drawn up by the architect however submission was delayed until the last possible moment so the Council could determine the application quickly in the knowledge that a delay in determination would result in the public house being demolished. The timing of the application meant that the decision to approve the scheme occurred, within days of the public consultation process for the revised planning application expiring. If you are looking to development you site, or would like to discuss the planning strategy that is ‘out of the box’ to secure the desired outcome, then then why not give us a call or send us an email to info@puretownplanning.co.uk.